Trying to figure out what all needed to go in the diaper bag was a huge struggle for me the first few times I left the house with my new baby. After a few rookie mistakes I learned to pack enough stuff for almost any circumstance. I will never forget my first outing. My daughter was 5-days old and I took her to a studio to get newborn photos taken. I only packed a sample pack of baby wipes in my diaper bag. (Why is this even a thing? You are tricking new moms into thinking this is enough wipes.) I was only going to be gone a few hours so surely that would be enough. Wrong! As soon as we got to the studio my LO had a diaper blow out and I used every last one of those wipes in the sample pack before she was clean. I was so embarrassed, but luckily the photographer had been around new moms before and was more prepared. I now always make sure I have an almost full pack of wipes at all times! I feel very lucky in that I have been surrounded by so many experienced moms during this first year with a new baby. I joined a running group right after my postpartum check up, called Stroller Warriors. (Stroller Warriors® is a FREE running club for military spouses and their family members.) These moms welcomed me with open arms and have been there for me to lean on and to learn from. 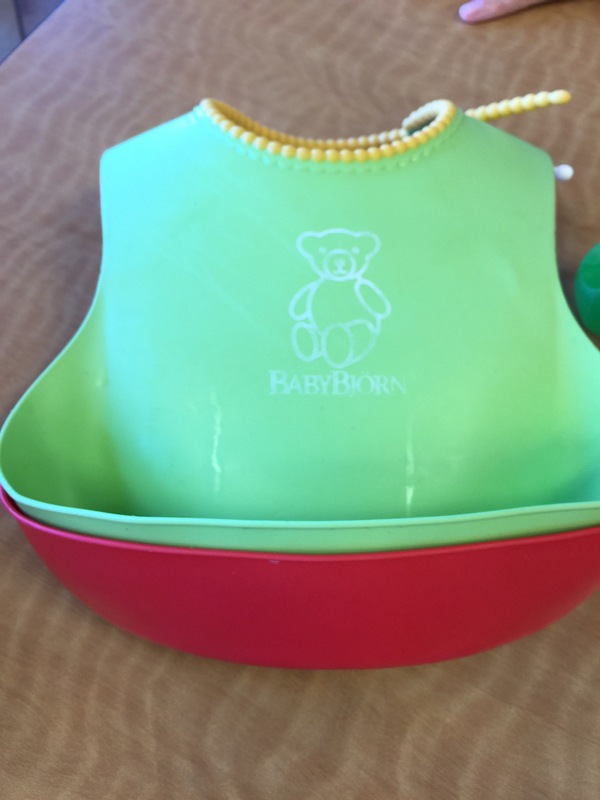 I invited my friend Leah, from the group, to go to lunch today so we could discuss her diaper bag. Every time I’ve been out with Leah I have been super impressed at her organization and ability to wrangle two little girls with such ease. She definitely makes being a mom of two look super easy. It might be because of her magical diaper bag. I swear she must have cast an undetectable extension charm on her bag like Hermione Granger (yes, I did just visit the Wizarding World of Harry Potter). Leah has so much stuff in her bag and everything is super useful I thought I’d get a list and share it with you all. 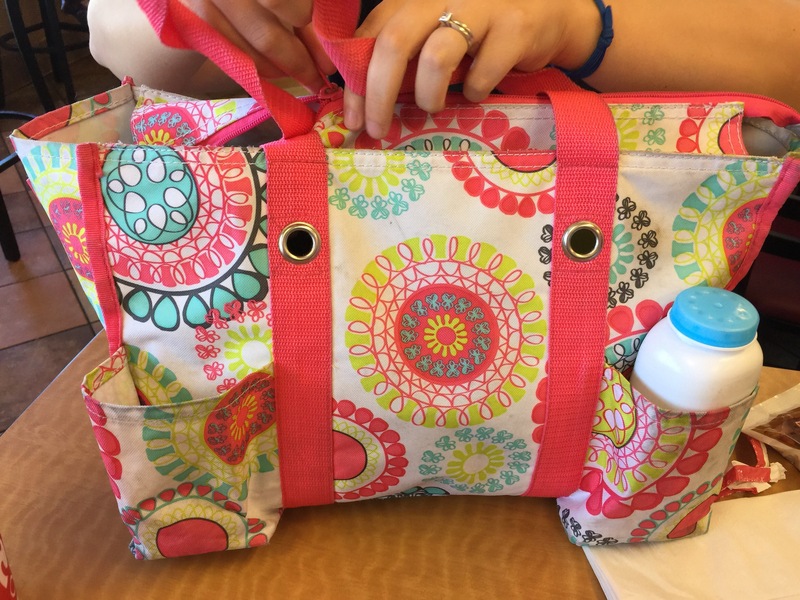 Thirty One Zip Top Tote – This is Leah’s FAVORITE bag for carrying baby things around. It has 5 pockets on the outside and two mesh pockets on the end that you can easily slide things into. It also zips on the top for safety of your personal belongings. It’s a little more on the pricey side, but totally worth it and they come in such cute colors. 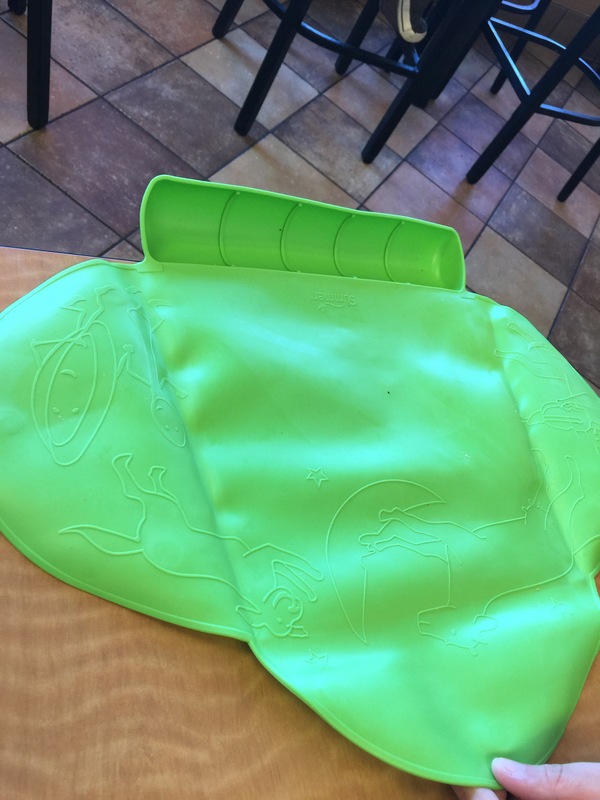 Tiny Diner Portable Placemat – These are the BEST when your kiddos start eating their own food in restaurants…you can wipe it down easily at the end of the meal and store it almost anywhere in any diaper bag. Only drawback I can find is that it does not stay wrapped up the way it comes in the packaging so I take a rubber band and put it around the rolled up placemat to keep it together and easily accessible. Baby Bjorn Bib – I get compliments on these bibs all the time! It catches anything that dribbles out of the babies or kids mouths! We throw the kids snacks into the pocket during picnics and the kids can access them easily all by themselves. Drawbacks are that they don’t condense down very much because they are molded plastic so they are a bit cumbersome but they are so stinkin’ easy to wipe off or even run through the dishwasher (on the top shelf!). Vera Bradley ID Card Case – I love this card case/wallet because my ID is always easily accessible and I don’t even have to take it out since there is a clear view pocket on the front. It holds a lot of cards, including annual passes, credit cards, business cards, etc. D Shape Aluminum Carabiner – If you can’t get anything else on my list, get this! 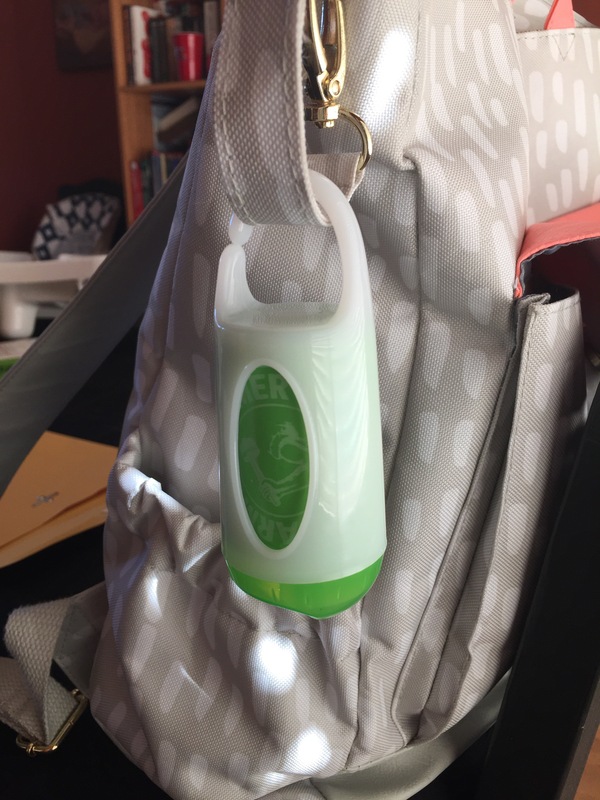 I hook my keys and wallet (ID card case) together on this D ring and the best part, I can hook it to ANY bag I choose and switch it around when I go from purse to diaper bag. It’s a security thing for me because then if someone tries to get my keys/wallet, they will tug on my bag and I will feel it! Baby Powder – This might sound like an odd “must-have” but if you’ve ever spent a sandy day at the beach, you will know why this is in my top picks! Baby powder gets sand off your kiddos like nobody’s business so it doesn’t just come in handy for poopy diapers! Just sprinkle it on any place they get sand and it comes right off as well as leaving them smelling like beautiful little babies, not stinky seaweed! It also comes in handy if you’re running around all day and don’t have a chance to run home to freshen up! Ziploc bags marked for each kid – Fill Ziploc with their essentials: diapers, wipes, change of clothes, etc. I never even thought of this, but Leah mentioned it is so much easier to grab the Ziploc bag marked for that kid if you need to do a quick diaper change. Also if you drop them off at daycare their stuff won’t get mixed up. 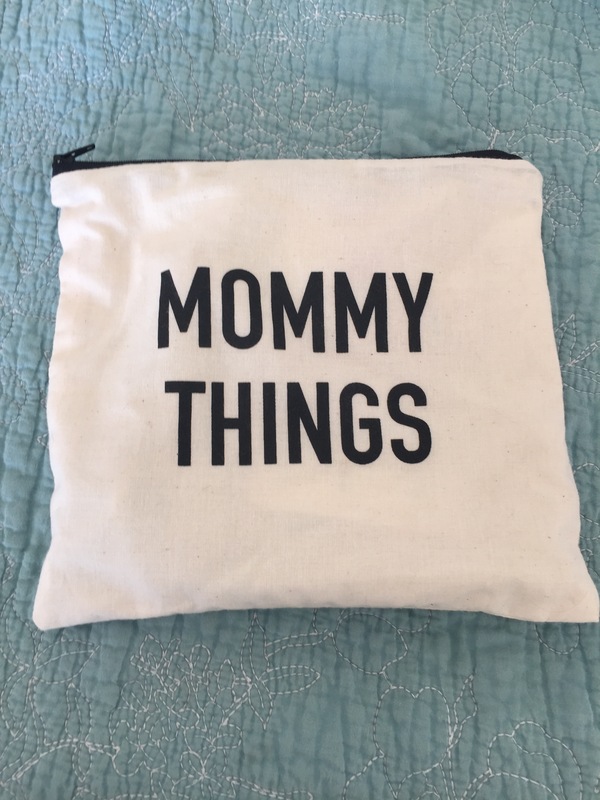 Mommy Things – you don’t want to leave home without your own essentials. Leah and I were discussing how easy it is to forget to take care of yourself when you are busy with your kids. Keep a bag like this in your diaper bag and you will always be prepared. Mine has Tylenol, sunscreen, pads, Kleenex, gum, and extra hair ties. Since my daughter is younger than both of Leah’s girls and doesn’t eat much solid food yet, I’ll add that it is also useful to keep a nursing blanket/cover in your bag at all times or formula/bottles. That way you are always ready if your baby needs to eat. I still keep an extra shirt for myself in the bag as well because my daughter was notorious for spitting up on me any chance she got. I hope this list is helpful for new moms or moms that are about to have two kids. I know it seems like a lot to lug around, but I promise you want to be over prepared so there is less stress on you and your kiddos. Let us know if there are any other “must-haves” and we will add them to the list.